Chavez Pownell Jr. came close to playing last season at safety for Wyoming. But in the end, coach Craig Bohl and the staff decided to keep the redshirt on Pownell to get him ready for the 2015 season. “It all worked out in the end. Whatever coach Bohl said I know it’s for the best,” Pownell said. Pownell is the only safety on scholarship on the roster right now for the Cowboys. After last Saturday’s first spring scrimmage, he was listed as the starter at strong safety — ahead of redshirt freshman walk-on Marcus Epps. Pownell had six tackles in that first scrimmage — the second-most among all defensive players. His four solo stops tied for the second-most. Wyoming released its fall camp schedule for football Thursday. A quick note to fans: All practices are open for only the first 30 minutes (for the media as well). And, the lone scrimmage of camp set for Saturday, Aug. 16, is closed to both the media and fans. First-year coach Crag Bohl told me at Mountain West Media Days in Las Vegas last week that while camp will be physical, there won’t be a lot of “hitting.” He said most of the hitting was done during spring. Former coach Dave Christensen held three fall camp scrimmages last season. First it was Brett Smith, now it’s Jason Thompson. Wyoming has lost its top two quarterbacks heading into the 2014 season. Smith declared himself eligible for the NFL Draft on the final Friday of 2013. On the first Tuesday of 2014, Thompson transferred to Utah. Thompson, who would have been a redshirt sophomore this season, wasn’t guaranteed the job for first-year coach Craig Bohl. But he was the most experienced player on the roster having played six games and starting one in 2012. He redshirted in 2013 to hone his quarterbacking skills. Is it ironic that Thompson is going to Utah where his former coach — Dave Christensen — if the offensive coordinator? Probably not. To think that didn’t play a factor would be naive. In fact, Christensen was officially introduced as Utah’s offensive coordinator Tuesday. Here are some links to what he said, and some stories by the fine folks at The Salt Lake Tribune. Former Wyoming football coach Dave Christensen was hired Friday as Utah’s offensive coordinator. Christensen and Utah coach Kyle Whittingham are long-time friends and colleagues. Both were assistant coaches at Idaho State in the early 1990s. 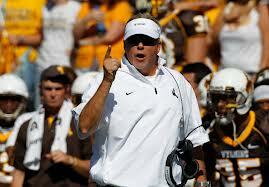 Former Wyoming football coach Dave Christensen was hired as offensive coordinator at Utah Friday. Wyoming athletics director Tom Burman talked to the media for about 20 minutes Monday about the firing of football coach Dave Christensen Sunday, and the process of finding a new coach. –Burman said he didn’t know until Sunday that he would fire Christensen, but also looked at the last four or five games and how the team competed. UW lost five of its last six games and lost four of them by between 28 and 38 points. –Burman said as of now he won’t hire a search firm, and “likely won’t even bring candidates on campus” for interviews. He said there won’t be an official search committee, but will draw help and feedback from staff members in the athletics department. Burman also said he has reached out to former UW coaches and administrators who “we trust,” such as former football coach Joe Tiller. –Burman said it would be ideal for the next coach to have college head coaching experience, but it won’t be a “deal-killer” if that’s not the case. Speculation became reality Sunday afternoon with the news Wyoming fired football coach Dave Christensen after five seasons. Did it surprise any of you? But where does UW go from here in its search for a new coach? Where do you think it should go? –Vic Koenning replaced Dana Dimel in 2000. Koenning was Dimel’s defensive coordinator and was given his first head coaching job after Dimel took a similar position at Houston. –Koenning won five games in three years, and was replaced by Joe Glenn in 2003, who won national titles at the Division II level (Northern Colorado) and at Montana (FCS). Wyoming’s 2013 football season came to an end Saturday with a 35-7 loss at Utah State. The final score wasn’t a surprise, but the way things transpired was — in a way. Here’s video of the team coming off the field after the game, while Utah State (8-4, 7-1) celebrated its Mountain Division title. The Cowboys played well defensively. Two turnovers from the offense gave Utah State short fields, which resulted in two touchdowns. UW also allowed a punt return for a touchdown. Even though Utah State isn’t an offensive juggernaut without starting quarterback Chuckie Keeton, UW allowed a season-low 310 total yards. The Cowboys were not overwhelmed defensively, and I agree with coach Dave Christensen’s assessment that the defense played well enough for the team to win this game. But the offense and special teams didn’t.